To make my Halloween doily I followed the vintage pattern, which is called Candy Dish Doily, but I used black and orange colors. 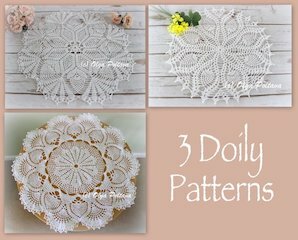 The pattern is from Star Doily Book No. 120 by American Thread Company, 1955. With Pink ch 6, join to form a ring, ch 4, d c in ring, * ch 1, d c in ring, repeat from * 13 times, ch 1, join in 3rd st of ch. 2nd Round. S c in next ch 1 space, * ch 3, s c in next ch 1 space, repeat from * 14 times, ch 3, join in 1st s c.
3rd Round. * 1 s c, ch 3, 1 s c in next loop, ch 5, skip 1 loop, repeat from * 6 times, 1 s c, ch 3, 1 s c in next loop, ch 1, tr c in 1st s c (this brings thread in position for next round). 4th Round. 1 s c, ch 3, 1 s c over the tr c, * ch 5, 1 s c, ch 3, 1 s c in next ch 5 loop, repeat from * 6 times, ch 2, d c in tr c.
5th Round. Ch 1, s c over the dc just made, * ch 3, 3 d c in next ch 3 loop, ch 3, s c in next loop, repeat from * 6 times, ch 3, 3 d c in next loop, ch 3, join in 1st s c.
6th Round. Ch 1, 1 s c, ch 3, 1 s c in same space, * ch 3, 1 d c, ch 3, 1 d c (shell) in center d c of next d c group, ch 3, 1 s c, ch 3, 1 s c in next s c, repeat from * 6 times, ch 3, shell in center d c of next d c group, ch 3, join in 1st s c.
7th Round. Sl st into loop, ch 1, s c in same space, * ch 7, s c in next shell, ch 7, skip 1 loop, s c in next loop, repeat from * 6 times, ch 7, s c in next shell, ch 3, tr c in 1st s c.
8th Round. * Ch 9, s c in next loop, repeat from * all around ending with ch 4, d tr c (3 times over hook) in tr c.
9th Round. 1 s c, ch 3, 1 s c over d tr c, * ch 2, 9 d c with ch 1 between each d c in next loop, ch 2, 1 s c, ch 3, 1 s c in next loop, repeat from * 6 times, ch 2, 9 d c with ch 1 between each d c in next loop, ch 2, join in 1st s c, cut thread. 10th Round. Attach Gold and Silver Spangle or White in ch 3 loop, ch 6, d c in same space, ** ch 2, s c in next d c, * ch 3, skip 1 d c, sc in next d c, repeat from * 3 times, ch 2, skip 1 loop, shell in next loop, repeat from ** 6 times, * ch 2, s c in next d c, repeat from * 3 times, ch 2, join in 3rd st of ch. 11th Round. Sl st into loop, ch 3, 2 d c in same space, * ch 5, skip 1 loop, s c in next loop, ch 5, skip 1 s c and 1 loop, shell in next s c, ch 5, skip 1 loop, s c in next loop, ch 5, 3 d c in next shell, repeat from * 6 times, ch 5, skip 1 loop, s c in next loop, ch 5, skip 1 s c and 1 loop, shell in next s c, ch 5, skip 1 loop, s c in next loop, ch 5, join in 3rd st of ch 3. 12th Round. Sl st in next st, ch 6, d c in same space, ** ch 5, * d c in next loop keeping last loop of st on hook, repeat from * once, thread over and work off all loops at one time (d c cluster), ch 5, 3 d c in next shell, ch 5, d c cluster over next 2 loops, ch 5, shell in center d c of next d c group, repeat from ** 6 times, ch 5, d c cluster over next 2 loops, ch 5, 3 d c in next shell, ch 5, d c cluster over next 2 loops, ch 5, join in 3rd st of ch 6. 13th Round. Sl st into loop, ch 3, 2 d c in same space, * ch 6, d c cluster over next 2 loops, ch 6, shell in center d c of next d c group, ch 6, d c cluster over next 2 loops, ch 6, 3 d c in next shell, repeat from * 6 times, ch 6, d c cluster over next 2 loops, ch 6, shell in center d c of next d c group, ch 6, d c cluster over next 2 loops, ch 6, join in 3rd st of ch 3.
l4th Round. Work in same manner as 12th round but work ch 7 loops. 15th Round. Work in same manner as 13th round but work ch 7 loops. 16th Round. Work in same manner as 12th round but work ch 8 loops. 17th Round. Work in same manner as 13th round but work ch 9 loops and end with ch 4, d tr c in 3rd st of ch. 18th Round. * Ch 9, 1 s c, ch 3, 1 s c in next large loop, repeat from * all around ending with ch 9, 1 s c, ch 3, 1 s c in d tr c, cut thread. 19th Round. Attach Pink in next large loop, ch 4, d c in same space, * ch 1, d c in same space, repeat from * 4 times, ch 2, * 7 d c with ch 1 between each d c in next large loop, ch 2, repeat from * all around, join in 3rd st of ch. 20th Round. * Ch 3, skip 1 d c, s c in next d c, repeat from * twice, ch 5, skip 3 d c, shell in next d c, ch 5, skip 3 d c, s c in next d c, repeat from beginning 14 times, * ch 3, skip 1 d c, s c in next d c, repeat from * twice, ch 5, skip 3 d c, shell in next d c, ch 2, d c in joining. 21st Round. Ch 3, s c over d c, * ch 3, skip 1 loop, 3 d c, ch 3, 3 d c in next loop, ch 3, skip 1 loop, 1 s c, ch 3, 1 s c in next loop, ch 3, 3 d c in next shell, ch 3, 1 s c, ch 3, 1 s c in next loop, repeat from * all around ending to correspond, join in d c, cut thread. 22nd Round. Attach Pink in center d c of 1st d c group to right of joining, ch 1, 1 s c, ch 3, 1 s c in same space, ch 2, s c in next loop, * ch 7, sl st in 4th st from hook for picot, ch 3, dc in ch 3 loop between next 2-dc groups, ch 4, sl st in 3rd st from hook for picot, ch 1, d c in same loop, ch 7, sl st in 4th st from hook for picot, ch 3, skip 2 loops, s c in next loop, ch 2, 1 s c, ch 3, 1 s c in center d c of next d c group, ch 2, s c in next loop, repeat from * all around ending to correspond, join in 1st s c. cut thread. I saw the diagram for this lacy stitch on Pinterest, and of course I had to try this stitch. I made a swatch using Caron Simply Soft yarn. I bought this yarn to make a scarf, though it's not going to be a lacy one. 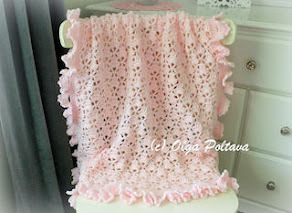 I have an idea for a ruffled scarf; I hope it will work out nicely. But this morning I saw a red rose blooming in my garden (how nice to be surprised with occasional rose blooms at the end of October), and I was inspired to try the red yarn for this beautiful stitch. Doesn't it look fancy and complicated? But it's not that difficult! It looks nice made with yarn, though the openings are quite big. I think this stitch will look best made with fine yarn or even crochet thread. Many crocheters prefer crochet diagrams, but not everyone is comfortable with them. So I wrote out the written instructions for this stitch. 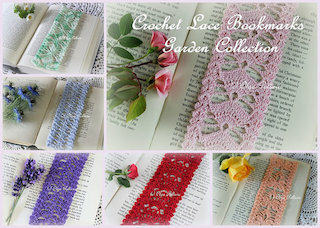 To make the swatch shown in the pictures, I started with ch 44. Row 1: dc in 5th ch from hook, ch 3, skip 3 ch, 3 dc in next ch, *ch 3, skip next 3 ch, dc3tog over next 3 ch, ch 3, skip next 3 ch, 3 dc in next ch* across, end with ch 3, skip 3 ch, dc2tog over next (last) 2 ch. Row 2: ch 8, turn; dc in each dc of next dc-3 group, *ch 7, skip dc3tog, dc in each dc of next dc-3 group* across, end with ch 3, dtr (yarn over hook three times) in last stitch. Row 3: ch 3, turn; dc in same beginning space, ch 3, dc3tog over next 3 dc, *ch 3, 3 dc in 4th ch of ch-7, ch 3, dc3tog over next 3 dc* across, end with ch 3, 2 dc in 5th (counting from the bottom) ch of turning ch-8. Row 4: ch 3, turn; dc in 2nd dc, ch 7, skip dc3tog, *dc in each of next dc-3 group, ch 7, skip next dc3tog* across, end with dc in next dc, dc in 3rd ch of turning ch-3. Row 5: ch 3, turn; dc in 2nd dc, ch 3, 3 dc in 4th ch of ch-7, *ch 3, dc3tog over next 3 dc, ch 3, 3 dc in 4th ch of ch-7* across, end with ch 3, dc2tog over next dc and turning ch. 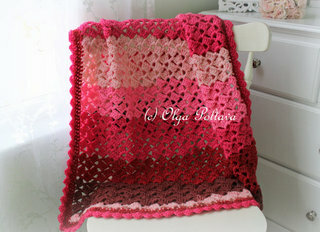 This is my second project using a super bulky (category 6) yarn. To make this vest, I used about two and a half skeins of Hometown USA yarn by Lion Brand Yarns. Because the stitches are so big and I used an open stitch design, the vest is super quick to make! Did I mention it's also super easy? The pattern and tutorial are available in my Etsy shop. And here is a lacy cowl fresh off my (size F) hook. I love how light and airy it is. The weather is still very warm, but this cowl looks lovely even on a t-shirt. I absolutely love the way it turned out. However, as I look at the picture now, I realize it would've looked even better in contrasting colors, so the rose would stand out more. For example, a white cowl and a black rose, or a black cowl and a bright red rose! Well, that's something to try in the future, though to be honest I don't like making the same thing more than once. 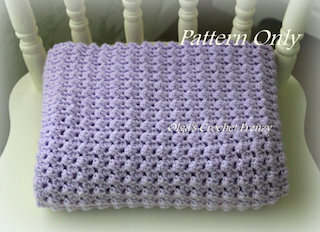 I just added the pattern to my Etsy Shop. Here in California, the weather is still summer like, and my roses are still in bloom. I've been working on some fall/winter crochet projects, but I still enjoy making doilies and photographing romantic summer vignettes. This doily is my own creation. It measures only 4.5 inches across, and has only seven rounds. I used some leftover crochet thread size ten, and 1.25 mm steel hook. 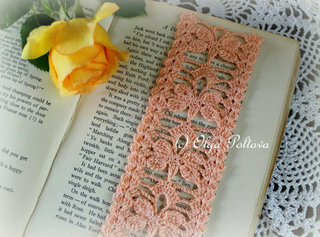 The doily is so small that it can be used as a bookmark, or maybe as a coaster. Ch 9, join in ring with sl st. Round 1: ch 1, 16 sc in ring; join with sl st to 1st sc. Round 2: ch 6, *skip next sc, dc in next sc, ch 3* around; join with sl st to 3rd ch of beginning ch-6. Round 3: *(sc, hdc, dc, tr, dc, hdc, sc) all in next ch-3 space* around; join with sl st to 1st sc. Round 4: sl st to tr, ch 7, *sc in next tr, ch 7* around; join with sl st to 1st sc. Round 5: *(sc, hdc, 2 dc, 2 tr, dtr, 2 tr, 2 dc, hdc, sc) all in next ch-7 space* around; join with sl st to 1st sc. Round 6: sl st to dtr, ch 13, *sc in next dtr, ch 13* around; join with sl st to 1st sc. Round 7: *ch 6, in 7th ch of next ch-13 make: (tr3tog, ch 4, sl st in 3rd ch from hook (picot made), ch 2, tr3tog), ch 6, sc in next sc* around; join with sl st. Fasten off. When I saw this Caron Simply Soft yarn, I knew I must buy it. 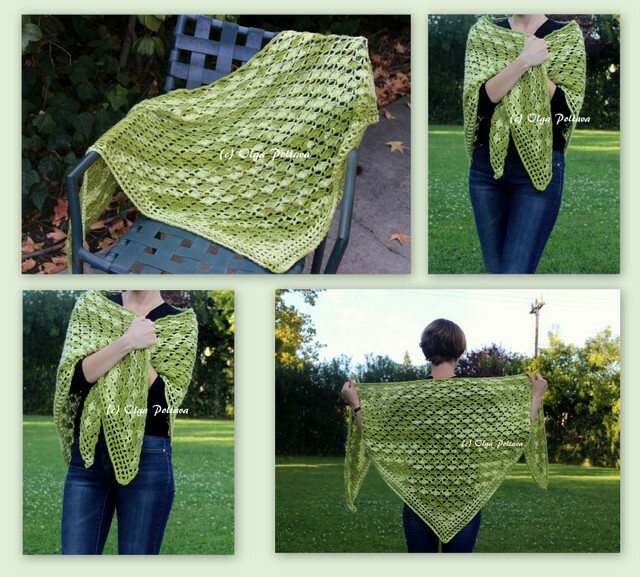 Green is my favorite color, and in this ombre yarn different shades of green blend together beautifully. I bought four skeins, which was enough for a shawl. Once I started crocheting it, I simply couldn't stop. I made the entire shawl in only three days. I debated whether I should add fringe, but decided not to. The shawl measures approximately 76 inches wide and 33 inches long. I wrote a very detailed pattern with stitch count and explanatory notes. I also included clear, close-up intermediate pictures for additional visual help. 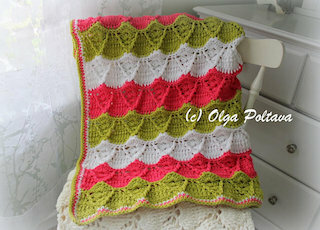 I believe even a beginner would be able to complete this crochet project. 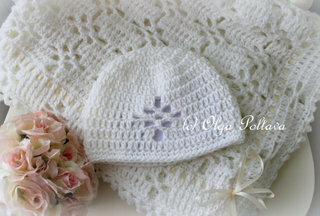 I will be adding this pattern to my Etsy and Craftsy shops soon. I was very excited about this doily. Unfortunately, it didn't turn out the way I'd like it. The problem is there seems to be too many stitches between the "leaves" (I covered them with rose petals for the sake of the picture, but you can still see what I mean). 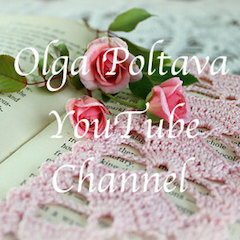 I noticed it when I was still crocheting the doily, but I hoped blocking would take care of that. 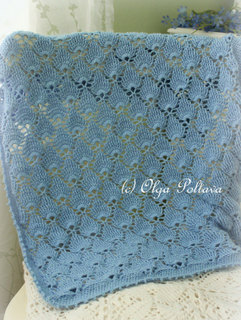 But when the doily was finished I realized that blocking won't help. So I'm going to unravel this doily, which is a pity! 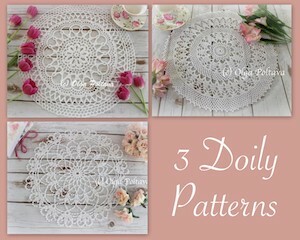 I wouldn't recommend this doily, so I won't even bother posting the pattern. Fortunately, I'm working on another project as well, and it's turning out wonderfully. Have a nice weekend without any disappointments! This is the reworked/adjusted for a bigger size beret from my previous post. For this girls set I used Simply Soft Party yarn by Caron. It took about four and a half balls of yarn at the price of $3.27 per ball, plus tax. So it's around $18 for the total yarn cost, which I think is a good deal. This yarn is soft and nice to work with. It's 99% acrylic and 1% metallic polyester. It's hard to see from the pictures, but this yarn has a thin metallic thread, which adds beautiful sparkle. And which girl wouldn't like sparkle? This set will fit a girl 5-10 years old. The finished measurements are about 19 inches in circumference for the hat, and 60 inches long and 6 inches wide for the scarf. 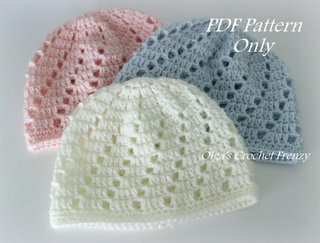 The pattern for this crochet set is available in my Etsy and Craftsy shops. Here is my second attempt at making a beret. You can see the first one here. I'm still working on the pattern. I want to rework it for a bigger size, so it will be suitable for a girl 5-10 years old. I also have an idea for a matching scarf. I bought the doll shown in the pictures last year. She's so adorable, and makes a lovely model. I've been on the lookout for a new one, but couldn't find one yet. Crocheting for dolls is so much fun! It brings back childhood memories. I haven't made any autumn projects this year yet, but I was looking through my past posts and found this cute little doily. 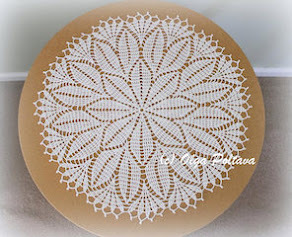 The symbol chart for this doily is available on FB. I like the collection of autumn leaves in this photo. The trees around my neighborhood only now slowly begin to change colors. Yesterday, my four-year-old son brought me a huge yellow mulberry leaf. Summer is now over, but here in California it doesn't feel like it at all. The weather is still very warm, and we only had one little rain so far. I'm not in the mood for autumn projects yet; I felt like making something spring like. The pattern for this doily is from Star Doily Book No.104 by American Thread Company, 1953. I used different colors than in the original pattern. 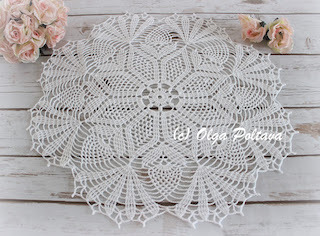 And I absolutely love how my doily turned out. 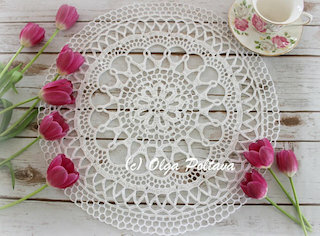 Making this doily involved a lot of thread cutting and attaching, so it was a bit tedious. But the final result is well worth it! With Shaded Yellows ch 9, join to form a ring, ch 4, 2 tr c in ring keeping last loop or each st on hook, thread over and work off all loops at one time, * ch 5, cluster st in same space (cluster st: 3 tr c in same space keeping last loop of each st on hook, thread over and work off all loops at one time), repeat from * 6 times, ch 5, join in top of 1st cluster st, cut thread. 2nd Round - Attach Green in any loop, ch 1 and work 3 s c, ch 3, 3 s c in each loop, join in 1 st s c.
3rd Round - Sl st to ch 3 loop, ch 4 (always counts as part of 1st cluster st), 2 tr c in same space keeping last loop of each st on hook, thread over and work off all loops at one time, ch 5, cluster st in same space, * ch 7, 2 cluster sts with ch 5 between in next ch 3 loop, repeat from * all around, ch 7, join in 1st cluster st, cut thread. 4th Round - Attach White in any ch 5 loop, s c in same space, * ch 7, s c in next loop, ch 7, s c in next loop, ch 7, s c in same loop, repeat from * all around ending with ch 3, tr c in 1 st s c (this brings thread in position for next round). 5th Round - 2 s c over tr c, * ch 5, 2 s c in next loop, repeat from * all around ending with ch 1, tr c in 1st s c.
6th Round - 2 s c over tr c, * ch 6, 2 s c in next loop, repeat from * all around ending with ch 2, tr c in 1 st s c.
7th Round - 2 s c over tr c, * ch 7, 2 s c in next loop, repeat from * all around ending with ch 3, tr c in 1 st s c.
8th Round - 2 s c over tr c, * ch 8, 2 s c in next loop, repeat from * all around ending with ch 3, d tr c in 1st s c.
9th Round - * Ch 9, s c in next loop, repeat from * all around, ch 9, join in d tr c, cut thread. 10th Round - Attach Green in any loop, ch 1 and work 5 s c, ch 3, 5 s c in each loop, join in 1 st s c, cut thread. 11th Round - Attach Shaded Yellows in any ch 3 loop, ch 4, cluster st in same space, * ch 4, cluster st in same space, repeat from * once, cut thread. * Skip two - ch 3 loops, attach Shaded Yellows in next loop, ch 4, cluster st in same loop, ch 4, cluster st in same space, ch 4, cluster st in same space, cut thread, repeat from * 6 times. 12th Round - Attach Green in 1st ch 3 loop after any cluster st group, s c in same space, * ch 8, s c in next ch 3 loop, ch 7, 5 s c in next loop between cluster sts, ch 3, 5 s c in next loop, ch 7, s c in next ch 3 loop, repeat from * all around ending to correspond, join in 1 st s c.
13th Round - * 5 s c in next loop, ch 3, 5 s c in same loop, 4 s c, ch 3, 4 s c in next loop, ch 5, 1 s c, ch 3, 1 s c in next ch 3 loop, ch 5, 4 s c, ch 3, 4 s c in next loop, repeat from * all around ending to correspond, join, cut thread. 14th Round - Attach White in any ch 3 loop above cluster st group, s c in same space, * ch 5, s c in next loop, ch 5, s c in next loop, ch 7, s c in next loop, ch 7, s c in next loop, * ch 5, s c in next loop, repeat from * 3 times, ch 7, s c in next loop, ch 7, s c in next loop, repeat from 1st * 6 times, ch 5, s c in next loop, ch 1, tr c in 1 st s c.
Repeat the 6th, 7th and 8th rounds once. 18th Round - 2 s c over d tr c, * ch 9, 2 s c in next loop, repeat from * all around ending with ch 4, d tr c in 1st s c.
19th and 20th Rounds - Same as 9th and 10th rounds. 21st Round - Attach Shaded Yellows in any ch 3 loop directly above the group of Shaded Yellow cluster sts of previous round and work in same manner as 11th round, but repeat from * 14 times. 22nd Round - Same as 12th round. 23rd Round - Same as 13th round.